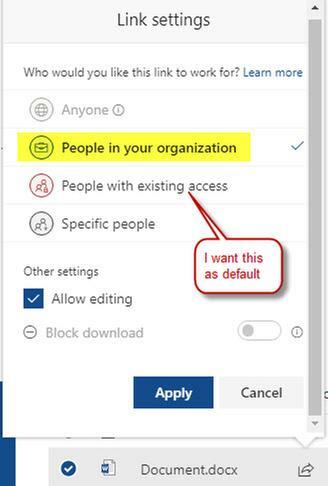 For SharePoint Online, can anyone identify a way to set the default tenant-wide link behavior so that it will default to "People With Existing Access"? Currently, there are only 3 options present via the UI, and a 4th option "none" available via PowerShell which sets the default link to the least restrictive option available. The business need for this is that the other link options will break inheritance on a document or item and create a "shareable link". This could potentially result in unwanted sharing of sensitive information. We are currently able to restrict this for the majority of the users by updating the access request settings (Site Settings > User and Permissions > Site Permissions > Access Request Settings) and disabling Allow members to share the site and individual files and folders. 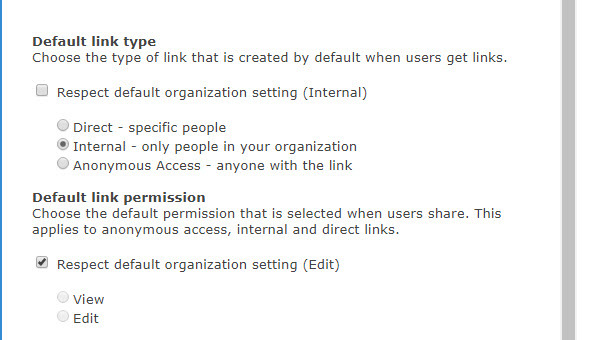 However, Site Owners can bypass this setting. It is not possible at this time to do so. I would suggest voting on this idea. Not the answer you're looking for? Browse other questions tagged sharepoint-online permissions office-365 or ask your own question. If a user cannot read excel file, can they view Excel Web Access? How do I change the default link type for the “Get A Link” option?